"The invasion of England escalates"
Vikings is back for its fifth season and starts off with two episodes titled “The Fisher King" and "The Departed." The fifth season picks up where the fourth season left off: the Lothbrok Vikings have defeated Wessex in battle and as a part of the peace deal they have been given East Angelia. But tensions are growing within the Lothbrok faction because Ivar the Boneless (Alex Høgh) killed his brother Sigurd, and Bjorn Ironside (Alexander Ludwig) plans to leave England and continue raiding the Mediterranean. The Lothbroks plan to continue their warring, turning their attention to the Kingdom of Northumbria. 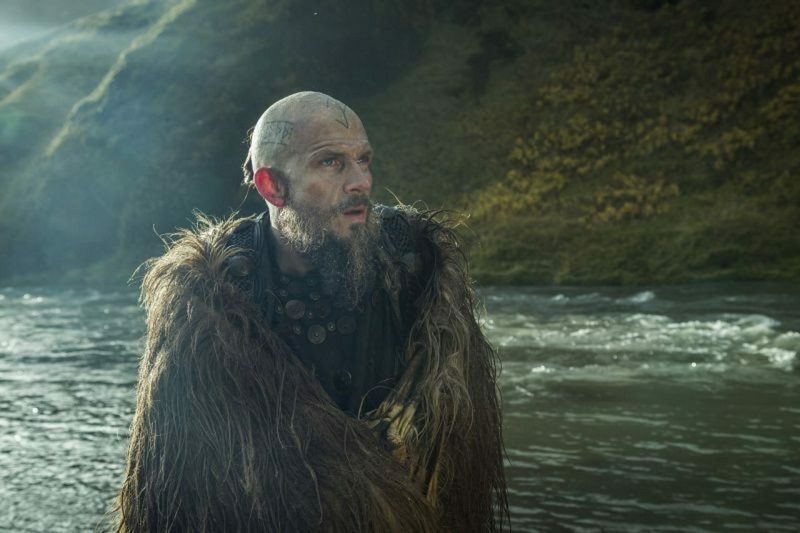 The shipbuilder Floki (Gustaf Skarsgård) sets out on his own quest after the death of his wife by making a ship so that he can sail the seas by himself. 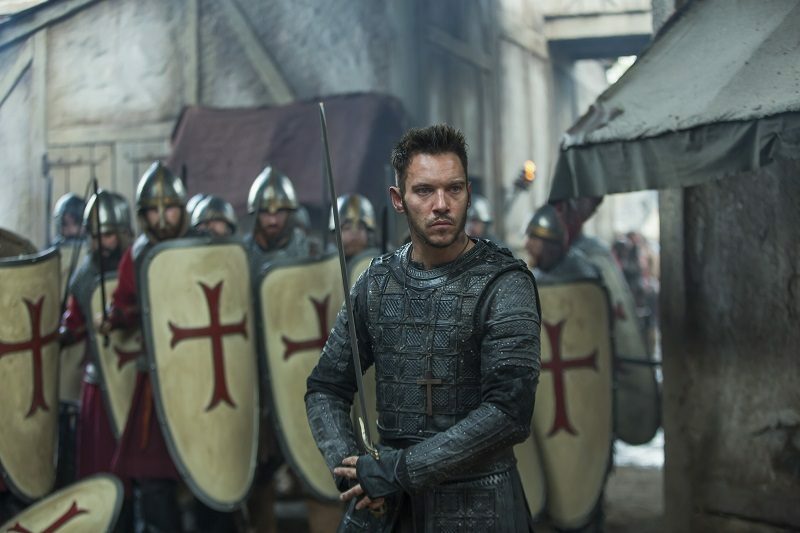 The warrior-bishop Heahmund (Jonathan Rhys Meyers) plans to rally the Saxon forces and fight off the Pagan forces who have conquered York. Back in Kattegat, Queen Lagertha (Katheryn Winnick) faces a challenge from a rival king, Harald Finehair (Peter Franzén), who has ambitions to become the first King of Norway. Vikings is a show that could rival the production values and action of any historical film and is about as historically accurate as Braveheart. Out of all the shows that came out on the coattails of Game of Thrones, Vikings is the only one that could really match its quality and fanbase. The fifth season continues with the high caliber spectacle, with the best sequence being the Viking conquest of York. As a military operation it is a minor skirmish where the Vikings shoot down the town's guards and climb the walls. The Viking conquest is more like scenes from the first season where the Vikings killed and enslaved the Monks of Lindisfarne and raided a Northumberland town. The Vikings deliberately picked the time when York was at its most vulnerable, when the townspeople were observing a religious holiday, and slaughtered men and women at the church. The death of the bishop by the Vikings was so brutal that it makes Viserys Targaryen's death in Game of Thrones look tame by comparison. The episodes also has the sets to match many Hollywood films, especially for the city of York. It actually feels like a lived in town and big place because of the city walls and buildings within the city. Vikings' contemporary series The Last Kingdom's main issues were it was action-lite and most of the towns shown were too small and sparse. There are also some great costumes worn by Heahmund's soldiers, even though they looked more like Templar Knights than soldiers who would have been around in the 9th century. Despite being in the middle of an Early Medieval war zone, Heahmund somehow has access to hair products. The events in England are when episodes are at their most engaging, where the bulk of the action and the drama is happening. This is due in large part to the growing rift between the Lothbrok brothers, who advocate different policies as well having their familiar rivalries. Ivar is the warmonger amongst them and this could be rooted in his disability: he lives in a society that values physical strength and he has to constantly prove himself. Ivar is intelligent, the best military strategist in the Viking faction, and is essentially a sadistic version of Tyrion Lannister. Within the Saxon faction Aethelwulf (Moe Dunford) and his family go into hiding after the defeat of Wessex and he has an equal amount of family drama because Alfred (Ferdia Walsh-Peelo) has fallen ill. The best scene featuring the Saxons is when Heahmund and Aethelwulf's armies join forces and the commanders actually talk about military tactics - setting up the promise of another battle for the third episode. However, to get to that point the show goes back to one of its weaker features - the supernatural element. Aethelwulf only joins Heahmund's forces because Alfred had a vision from his biological father telling him to go York. The events in Kattegat are an attempt by the show to reintroduce parts of the first two seasons where Ragnar Lothbrok fights for control of the region. However, in Lagertha's case, she is in a position of strength and fighting to keep her position. These events were sadly the least interesting part of the episodes because the characters aren't as engaging. "The Fisher King" and "The Departed" are a solid start to the season that gives fans what they want. "The Fisher King" is the stronger episode because it had more action, drama and was better at setting up the plotlines for the season. The show, however, has become incredibly bloated at this point due to having so many characters and locations: even longtime fans will be lost - let alone any newcomers.